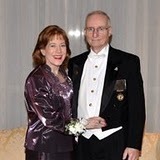 These are pictures I have taken of the 2008 Grand Master of Masons in Virginia, Most Worshipful Edmund Cohen during his official visits to Masonic events. "The most photographed Grand Master in Virginia, ever!" Over 3,969 pictures! In addition, there are also more pictures that have been taken by his team at other events that I was not able to attend. Thanks, MW. Ed, I had a great time visiting all the Masonic events with you and Gwen over the past year!!! 11-05-08 through 11-08-09 Grand Lodge of Virginia Grand Annual Communication held on November 5-9, 2008. at Sheraton Richmond West Hotel. 397 pictures CLICK HERE. Click on picture of MW. Ed, to see all 397 pictures. or sit back, relax and enjoy the slideshow below. 11-04-08 MW. Ed's last official visit, Fredericksburg Lodge No. 4. Celebrating the anniversary of the initiation of Brother George Washington. 42 pictures.